← Poem – Poets are born in the strangest of homes. Home » Creativity » Finding patience in a Monet painting. Finding patience in a Monet painting. I came across a Monet painting recently and noticed the date. I was surprised to find out that it was completed over the course of four years. I’d always thought that I was a slacker if I didn’t finish an art project in a few days. 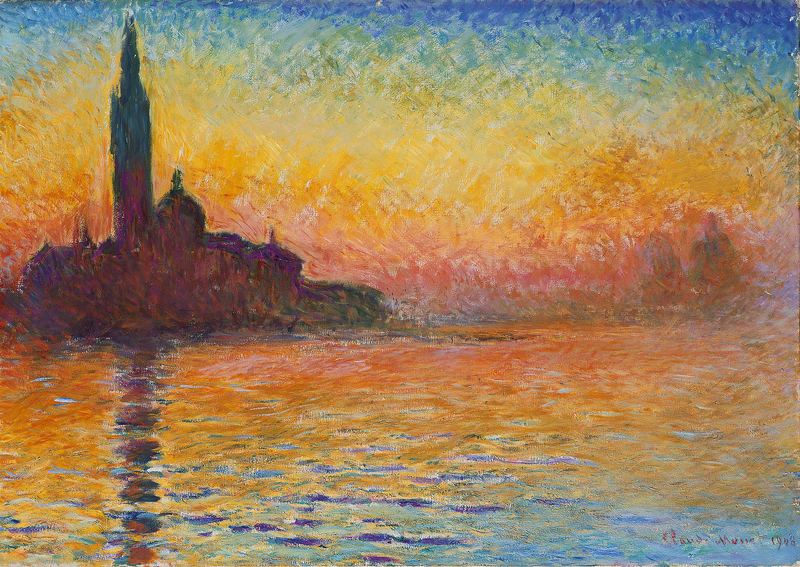 It is called “San Giorgio Maggiore at Dusk”, or in the original French, “Saint-Georges Majeur au Crepuscule”. The dates are 1908-1912. This looks like a pretty simple piece to me. This looks like something that could be knocked out in an afternoon. But then again, I’m not a famous artist. Maybe the trick is that he just makes it look simple. I’ve decided to take this to heart. I’ve decided to be more patient with my art and with myself. This is a dangerous place to be for me. If I don’t push myself enough I won’t do anything. I’ll let projects sit half completed. I’ll start things and not finish them. But then again, if I do things too fast, I’ll not have time to do them well. I’ll not take the time to let them digest, or ferment, or mellow. Some things are better if they are done slowly. Some things have to be done slowly if they are going to be done right. I’m not in a race. I don’t have any assignments. Creating isn’t my job. There aren’t any deadlines. The only rules I have are ones I’ve created. I’m reminded of Luke Skywalker about to enter the cave on Dagobah. The only thing he took in there was himself. Sometimes that is the scariest thing of all. When I create, I take with me all the rules that I’ve been given of how things have to be and all the rules I’ve made up. I put limits on myself before I’ve even begun. I have expectations that prevent me from finding innovations. Part of my practice this year is to not limit anything, anymore. It is to be open and trusting to what God is leading me to be and to become. Part of that practice is to encourage you to do the same. This entry was posted in Creativity, Encouragement and tagged art, art as a metaphor for life, Monet, practice, self love. Bookmark the permalink.